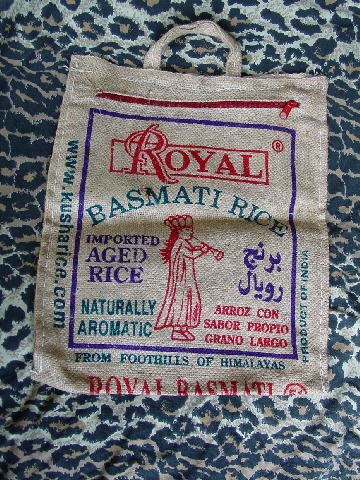 This burlap (never used as a purse, but it originally held rice) tote says Royal in red letters and Basmati Rice in green letters. The designs and rest of the words are in red, green, and purple. It also has a purple outline and a red 9" long horizontal front zipper. There is a 7 1/2" long top handle. It has an orange dye spot on the M (under the R in Royal). 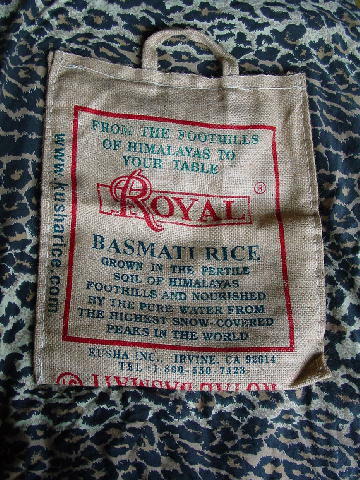 In the back it says in green letters "From the foothills of Himalayas to your table". The back has a red outline and the rest of the letters are in red and green.